Jewelry with soul, that says, "My intention is to do good, to repair that which is broken, to provide strength to those who feel weak." 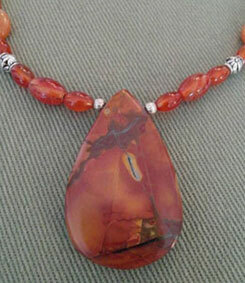 Browse our catalog of all natural, colorful stone pendants, currently available for custom designed necklaces. 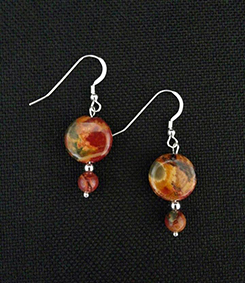 Earrings and necklaces in colors that make your eyes dance and your heart smile. Whether it is a small, indigenous tribe or one of the world's "Super Powers," in order for any community to survive, it must have Warriors willing to go into battle to protect its members and Feminine Warriors willing to do the community's healing work that must come after a battle. This is the yin-yang of war and peace. And it is not gender-specific; the Feminine Warrior is anyone who draws from the Feminine energies of love, nurturance, understanding, patience, and Spirit. Sometimes, the Feminine Warrior works to assist the healing of those around them; sometimes, the work is to heal themselves. Doing the work of the Feminine Warrior is not easy. It requires Courage, Energy, Wisdom, Strength, Integrity, and Determination. It is often done quietly, without much fanfare, and is frequently overlooked and under-appreciated. Jewelry for the Feminine Warrior is designed with two distinct purposes: to honor the sacredness of this difficult journey, and to provide the Feminine Warrior with an empowering Shield as they wage battle against suffering, rage, guilt, shame, fear or sorrow. 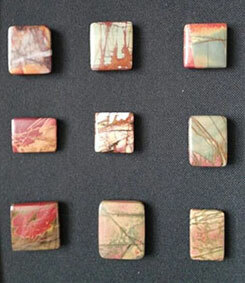 Made primarily of Red Creek Jasper, these pieces are simultaneously beautiful esthetically and powerful energetically. I wanted to create a line of jewelry that assisted in bringing one's attention inwardly, into a more contempletive state, to enhance one's self-awareness and self-acceptance. I can think of no better state to be in when exploring deeply one's own actions, thoughts, and feelings than in a state of deep compassion. Compassion towards others, after all, must begin first and foremost with compassion for ourselves. We must accept that we are imperfect--but spiritually expanding--creatures. Some of these pieces are more playful, honoring our child spirit that is sometimes pushed aside by our more industrious adult selves. 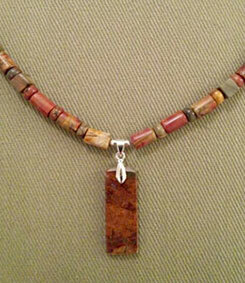 Some of these pieces are meant to help ground and center the Spirit within, to quiet the mind. 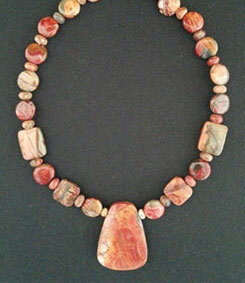 Made with Red Creek Jasper, Bali beads, and other spiritually calming stones, these pieces radiate Peace and Compassion.